Painting is one of the easiest and most economical ways to enhance your homes beauty, both inside and out. 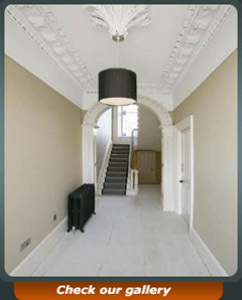 Our Professional Painter & Decorator finishes refreshes, revitalises the living space of your home. You can avail of our colour selection advice so that your new colours can lift spirits, bring calm and give tired old spaces a blast of new energy. You will be delighted at what a difference our professional, quality paint finish will make to your home, business or shop. So if you are looking for a painter in Dublin Call byrybak.com Painter & Decorator services Today. Paul Rybak has been providing a superior service and first class professional Painter & Decorator services for your home or business. We are a small Painting company in Dublin who focuses our attention and efforts on your project from start to finish. Great customer service and long lasting paint jobs is our trademark. For homeowners who know what they want in a superior, personalized home painting service company and are willing to pay a little more for it, byrybak.com painting solutions is the right choice. Paul Rybak and byrybak.com painting solutions are committed to providing the best house painting services in Dublin combined with the most comfortable customer experience available. We maintain our own full time experienced crew of house painters in Dublin that are courteous, clean, and skilled. Call today 0857124092. With Paul Rybak you not only get a professional painting contractor, you get an honest, experienced friend in the construction business. We work closely with homeowners, interior designers and general contractors to ensure the best results for you. Our company guarantees clean, efficient and prompt Painting service. If you are looking for a quality house painter with professional, hassle-free Painting service, look no further and call Paul today. For The ultimate Painter & Decorator based in Lucan.